tvONE is expanding the tvONE Training Academy with a new studio area to enable the development of an extensive suite of online tutorial videos as well as the expansion of its series of webinars. The tvONE Training Academy StudioCommenting, Mark Trevena, training manager of tvONE said, "Our CTS accredited hands-on sessions remain popular, but we hear from clients that their time is becoming more and more precious. The tvONE Training Academy Studio provides a solution that maintains the high quality of presentation and content our partners, installers and end users expect, but provides new formats and forms of content that they can access instantly online at a time that suits them." In order to deliver a high standard of presentation, the studio is fitted out with over $100,000 of third party and tvONE equipment. tvONE has already created over 20 short videos from brief product overviews and unboxing videos to in-depth step-by-step tutorials on how to deliver specific functions. The company will continue to offer CTS accredited Pro AV modules face-to-face, over the web or at client sites. The studio area in the Training Academy is a multi-use space that is available for hands-on training but can be converted into a studio for creating webinars and online tutorial videos, in minutes. 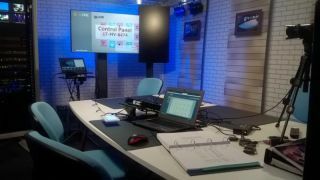 The studio is operated by the presenter and uses multiple cameras allowing close-ups to be mixed with views of the presenter. It is possible to live cut and stream out over the web, but most sessions are recorded and edited before uploading. The tvONE video channel can be found here (https://www.youtube.com/c/Tvone-AV), not to be confused with the US cable channel of the same name, especially on Twitter.